I’ll confess that I’ve lost some of that creative mojo. It has been drained from me over the last 3 weeks and now I’m trying to get it back. Lots of stamping and creating that I can’t share with you yet. But, stay tuned! Fridays are so much more enjoyable lately since I gave up working night shifts on this day. Family, evening high school football games, and just lounging around seem to be my plans for this day lately. I’v had these stamp sets, Bella Blossoms & Bella Toile Background, for over a month now and thought they’d be perfect for the sketch. I shy away from flowers, but that’s a challenge due to all of the new flower stamp sets (especially love the silhouettes). And, I hardly ever go “vintage” lol. I combined, changed, added, played with the new Big Shot, and this is what I came up with. The upper top big flower was stamped a couple times and cut out for sponging/shadowing, layering, adding dimensionals. It does pop off of the card front. CARDSTOCK: Kiwi Kiss, Chocolate Chip, Whisper White, Riding Hood Red, and Bella Rose Designer Series Paper. INKS: Pink Pirouette, Riding Hood Red, Chocolate Chip, and Craft Whisper White. ACCESSORIES: Pretties Kit; Chocolate Chip Taffeta Ribbon; Hodgepodge Hardware Styled Silver; Big Shot and Bigz Top Note Die; Stampin’ Dimensionals; Sponges. Absolutely stunning…. truly stunning, MJ – hope you get your mojo back . . . and soon! Hugs, sweetie! From the looks of this card your mojo was never missing!! I’ve been holding out on buying this set because I wasn’t able to have any vision for it. I’ve been hoping SOMEONE would show me a reason to love it. Mission accomplished. Absolutely stunning! Oh my word, this is simply AMAZING! (I wanted to say “stunning”, but it looks like that word is already taken, LOL.) I had absolutely no desire for this set, but oh my… that’s certainly changed now! And this is what you do when your mojo takes a break?! WOW. Absolutely FABULOUS. Oh, crap. I told and told myself I would not buy that flower. Just lately, I’ve seen the most beautiful samples with it and I kept saying, “nope, not buying, nuh uh, no way.” Well, thanks for pushing me right over the edge. This is GOJUS!! My bank account is gonna be hurtin’! And it’s your fault, LOL! Wow, this is absolutely STUNNING! I love what you’ve done with this flower. Beautiful!! Thanks for sharing your artwork!!! Absolutely stunning card! The flower is gorgeous!! I love the colors. Fantastic work! Ummm…this is absolutely gorgeous! Looks like the mojo is back! Wow! Looks like all my adjectives of choice have been used – Absolutely Amazing will have to do!! Hope you find your mojo soon! This is scroll-stopping-ly beautiful. My jaw fell open when I saw it and “WOW” came out. Thanks for sharing. This is stunning, Mary Jo!! 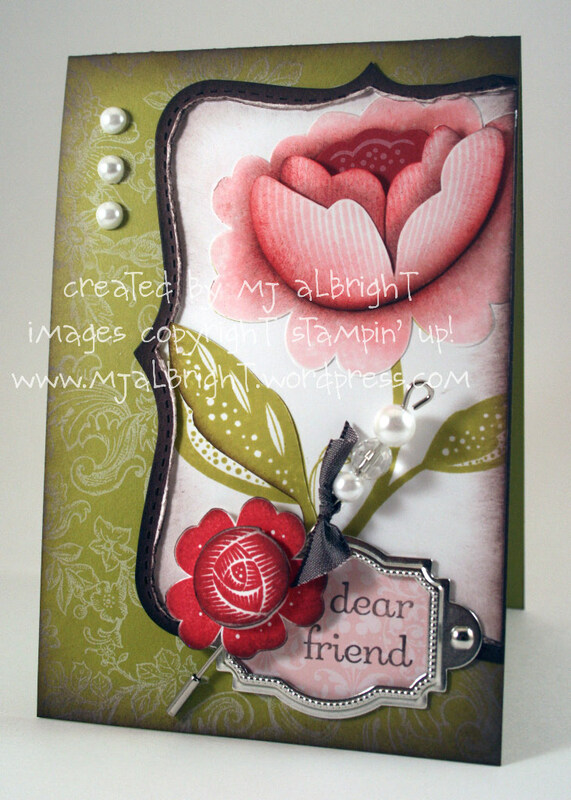 Your shading is perfect, and I wasn’t a fan of this set…..until I saw your gorgeous card!! Why must you make such awesome cards with sets not on my wish list? Torture. Seriously, though. This card blew me away! Lost your mojo? you? never! This is beautiful! I own this set, can’t wait to break it out. I’ve been waiting on my top note die. Once again you prove you have more artistic talent in your baby finger than most of us in our entire being. Just incredible, MJ. Gorgeous card, MJ!!! Lost your MoJo? Doesn’t look like it to me! I always look forward to your next creation. Thanks for the inspiration! My jaw dropped to floor when I saw this card! Can you say BEAUTIFUL?!!!! Wow! Just wow!! I just LOVE this card! what great details and fun accessories!! Love how you layered the flowers! Absolutely gorgeous, MJ — the stick pin adds so much dimension to the flower stem! Love your use of the Top Note die! Wow, Mary Jo! This is gorgeous! Absolutley lovely! Have a great weekend! Holy MOLY!!! This is STUNNING, and I don’t even like that set…WOW!! Mary Jo, this card is incredibly gorgeous! … a real jaw dropper! Wow that is above and beyond gorgeous! This is gorgeous Mary Jo! Such awesome detail on your card! LOVE it!! SImply stunning! Love all the elements, the hardware for the sentiment, the pearls , stick pin, just everything! First of all, I have been wanting this set since the cat. came out. This however, I almost don’t want to buy it anymore because I know I could NEVER create anything this beautiful… you will need to do a step by step tutorial for the shading… this is SOOOO beautiful. Thank you for sharing it! Love shading and layers on this flower makes it come to life! I don’t need this stamp set. I don’t need this stamp set. I don’t need this stamp set…. That is so amazing! What a gift to behold! Wow Mary Jo, that big flower looks a m a z i n g!! WOW I wish my MOJO looked this good when my MOJO is active. LOL This is just beautiful. Love the colors and the layout. my jaw dropped to the keyboard when I saw this! holy toledo, batman, it is beautiful!!!! that stickpin just adds the perfect touch. Wow – This is amazingly BEAUTIFUL….thanks for sharing. This is a gorgeous card! You did a fabulous job on it. Thanks for sharing. Well if your mojo was missing, I think its back. This is unbelieveable! I know you explained how you did this, but I still don’t understand. This is the best use of this stamp I have ever seen. Now I really want to buy it! Great job! this is fabulous. this was one of my first purchases from the catalog and I can’t wait to try this!!!! Gorgeous!!!! This is absolutely gorgeous!!!!! I’d love for you to do a tutorial for this one. I had no idea that that set could look that great! Thanks for sharing. Wow that is just BEAUTIFUL. I love how you did the colouring/shading. This is gorgeous!! Love how you colored that big flower! Whoa. That is stunningly beautiful! This is just Gorgeous, I would say you haven’t lost a thing, the shading of the flower and dimension is out of this world! Oh my gosh, this is incredible. It doesn’t even look stamped, it looks…….I don’t know, 3D! Awesome! Oh So Beautiful! I just love your coloring and the layout and background stamp and pretties! Wonderful job! Your card is simply gorgeous. Great coloring. WOW! The flower is just amazing and the pretties add the perfect touch. Creative card, colors, background. I like you do not care for victorian or vintage usually, but this is fabulous. How can you say you lost your mojo? It’s there girl! GREAT JOB! I love it! Did I say WOW? WOW! WOW! WOW! Love it. This is so gorgeous ! You ROCK ! MJ, your card took my breath away! Your card looks incredible! It’s soooo beautiful! It has been awhile since I have visited your blog and I just have to say that this card is absolutely stunning…I have been on the fence about this set, but I’m jumping off now!! Wow! This card is amazing! I love the way you added the pin and layered that beautiful flower. Oh my gosh, Mary Jo, I missed this one. What a beauty! I didn’t like this set until seeing this card, just fabulous!